Stevia is a zero-calorie artificial sweetener that can be used as a sugar substitute. Stevia is derived from an herb native to South America and has been connected to hypertension and hyperglycemia prevention and treatment. Although side effects are uncommon, they may include intestinal gas and pain. Stevia extract is 200 to 300 times sweeter than table sugar. Because it has no calories, stevia is commonly used as an artificial sweetener. The Food and Drug Administration has recognized a highly processed form of stevia, rebaudioside A, as a safe for use as a sweetener. No other form of stevia has received FDA approval. In studies, some participants have reported abdominal fullness, myalgia and nausea when they've consumed stevia, although symptoms generally disappeared within one week. 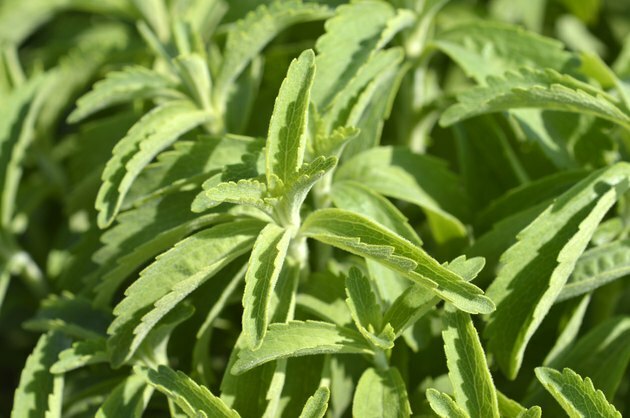 Stevia has also been connected to weak mutagenic activity, neurological side effects and gastrointestinal pain in experiments on rats. In those experiments, however, the rats consumed amounts of stevia that equaled half their body weights. As amounts humans consume is infinitesimal compared to body weight, these side effects appear unlikely. Diarrhea is not considered a side effect of stevia. Read the serving-size information on your stevia products. The average person consumes about 20 teaspoons of added sugar each day but its recommended that women aim for no more than six teaspoons of added sugar per day and for men, 9 teaspoons. You can try to reduce your overall intake of added sugar by using stevia. There is no credible research that suggests 4 grams or less of stevia causes long-term intestinal pain, although you may encounter gas or discomfort in the short-term. The average serving size of stevia is 1 teaspoon. The FDA has not approved the entire stevia plant or unprocessed stevia extracts for consumption. Do not eat any stevia substances that are not approved by the FDA. Their side effects are unknown.